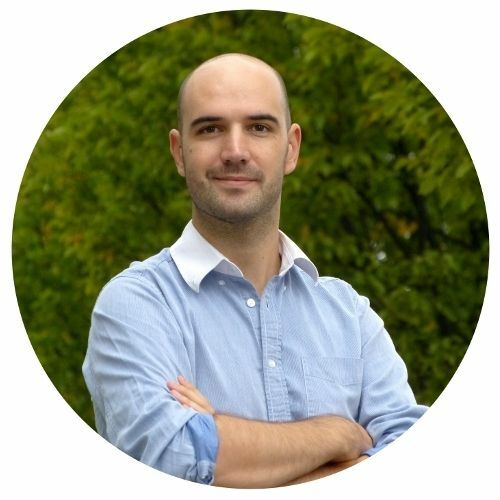 Ideas, tips and tricks about BulkPublish. 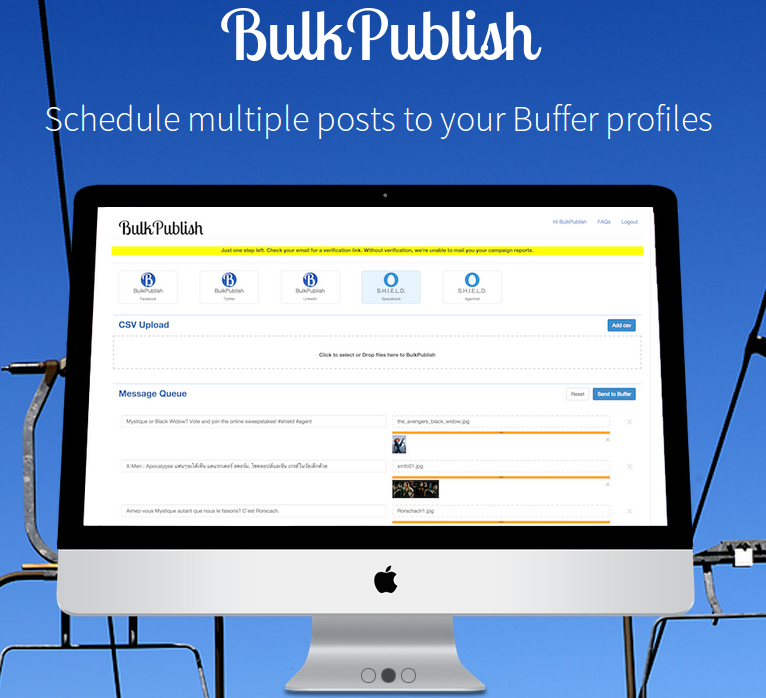 We’re going to explain how to automate Twitter, Google+ and Facebook posts and being more productive by importing content in CSV format to Buffer using BulkPublish. 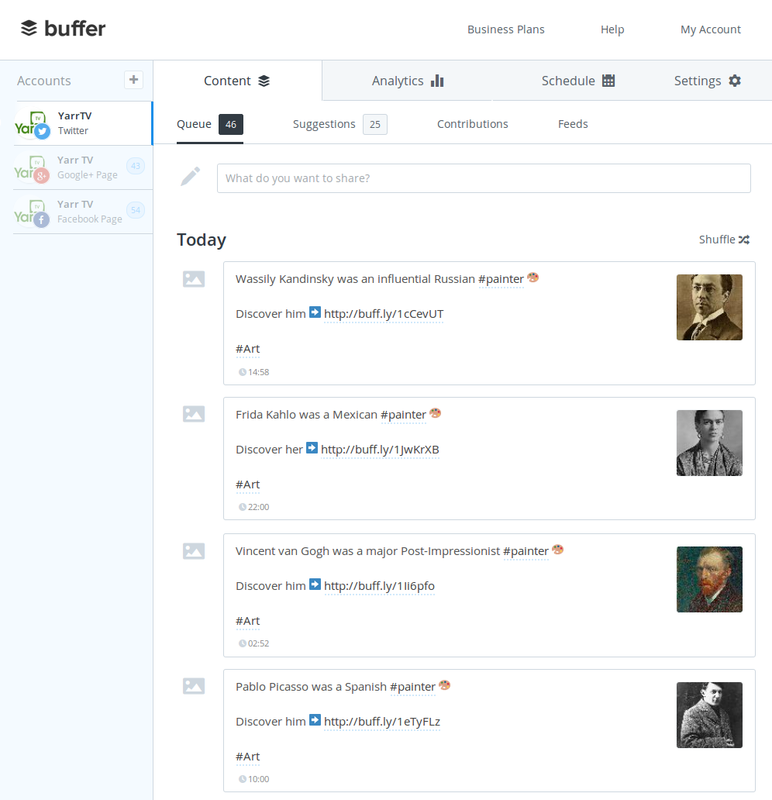 Buffer is a super useful and simple tool to program our own posts or third-party ones to be published on your social networks. We just have to register with our e-mail or our Twitter or Facebook account and connect our different social media accounts to Buffer, allowing its access. 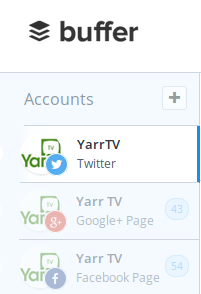 In our case, we add Twitter, Google+ and Facebook accounts of Yarr TV. With Awesome paid version we’ll be able to manage more social media profiles and add more posts from a single Buffer account. 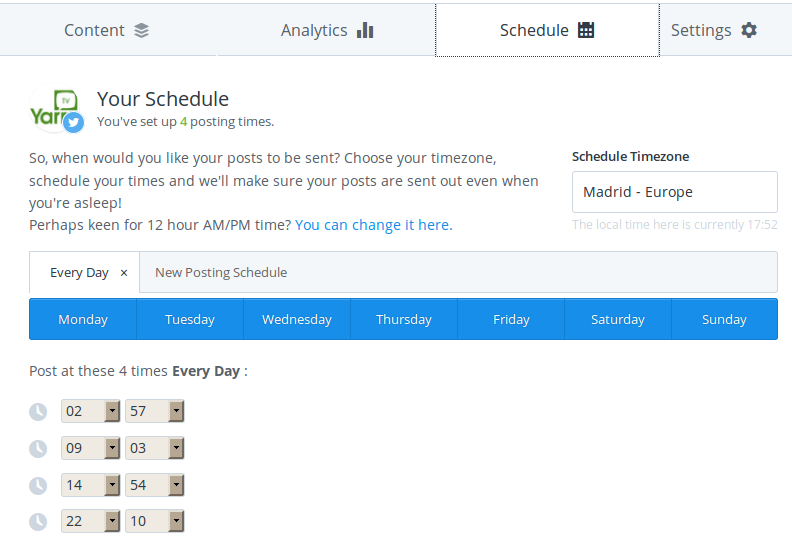 In Schedule section we can select for each social network the days and hours we want our content to be published. From Content section we can directly publish or select third-party contents in Suggestions. However, we’re going to see how to use BulkPublish to add contents selected from a spreadsheet. In Posts sheet we can add new posts by numbering the cells of B column and writing the text for each of the social networks. Use Selected posts column to choose the contents to be published and their order: order shown in the image will result in a CSV file with posts 3, 1, 4 y 2, numbers that match with numbers in B column. If we want to add emojis to Twitter posts we can use PiliApp.com and Symbols&Emoticons.com for Facebook (Google+ doesn’t properly support emojis in posts). We also recommend using an URL shortener: an interesting tool for this purpose is Sniply, that allows us to add custom messages to links. Once posts have been selected in the right order, they’re ready to be exported to CSV files in Twitter, Google Plus and Facebook sheets. 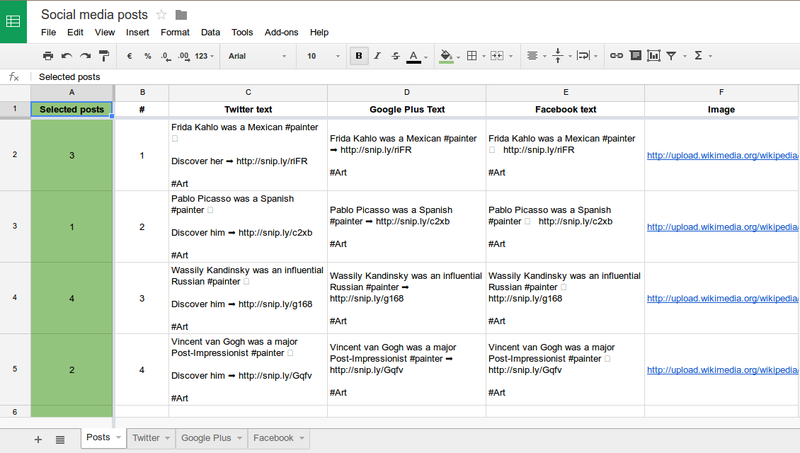 We access Twitter sheet and drag the formula from A and B columns if we’ve added more posts. Then, we just click on File > Download as > Comma-separated values (.csv, current sheet) and save in our computer the CSV file generated as Social media posts – Twitter.csv. 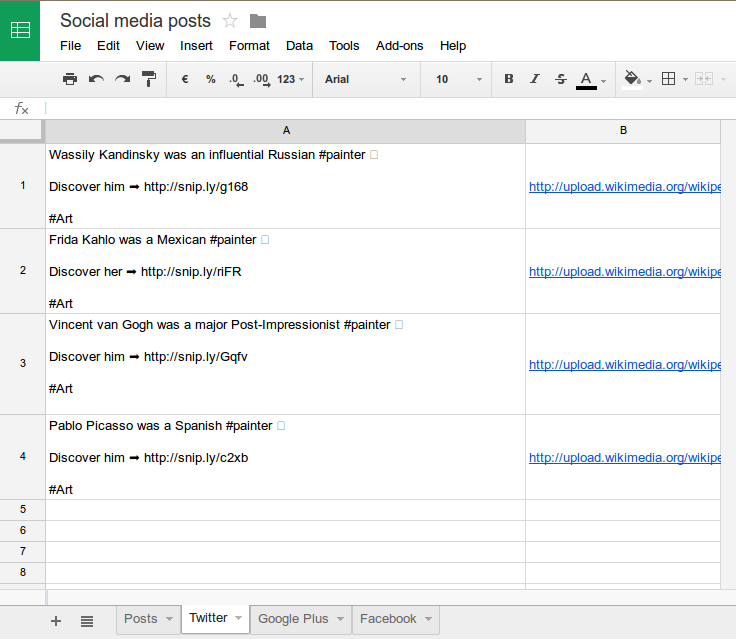 We just repeat the same steps in Google Plus and Facebook sheets. BulkPublish is a tool still in beta that offers a free, simple and efficient solution to add content to Buffer from a CSV file generated from a spreadsheet. We create a BulkPublish account using our e-mail and we connect our Buffer account allowing its access. Once connected, first step is importing previously generated CSV file with our posts. We just click on Upload your CSV and select in our computer the file Social media posts – Twitter.csv. Second step is reviewing that the CSV file has been properly uploaded: we click on Next if everything is correct. Third and final step is to select the social network account we want to publish in and click on Send to Buffer. Once the process finishes, we access Buffer again and review that contents have been properly imported in Content section for the corresponding social network. 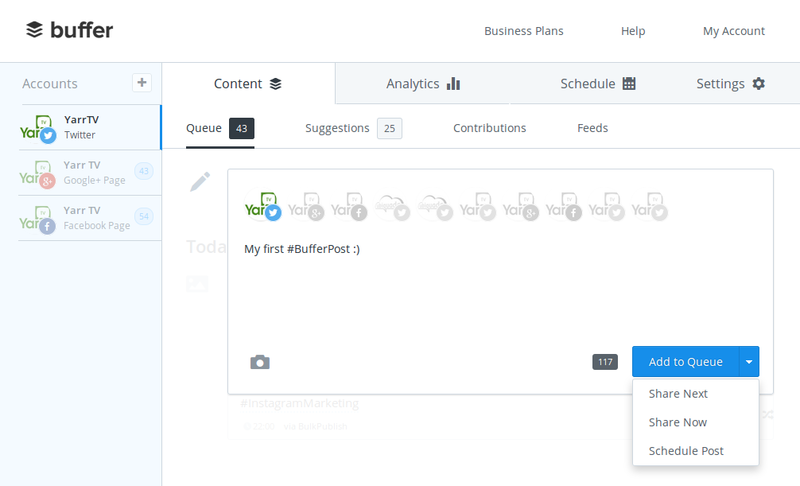 In Buffer we can review again the contents before publishing, edit them or delete them. We repeat the same steps in BulkPublish to program content for Google+ and Facebook. If we have contents that we frequently repeat in our social media posting calendar, taking some time to add them to a Google spreadsheet to be able to export them easily to CSV format and import them to Buffer using BulkPublish will significantly increase our productivity. Using these 3 solutions separately is very helpful, but combined they result in great savings of time. We develop solutions to amplify your social media, let’s talk!